When Shakespeare was young and in love, he wrote a gushing letter to his bride-to-be, enclosing with it a lock of his hair and five verses. Or that’s what an audacious teenager in the 1790s would have us all believe. 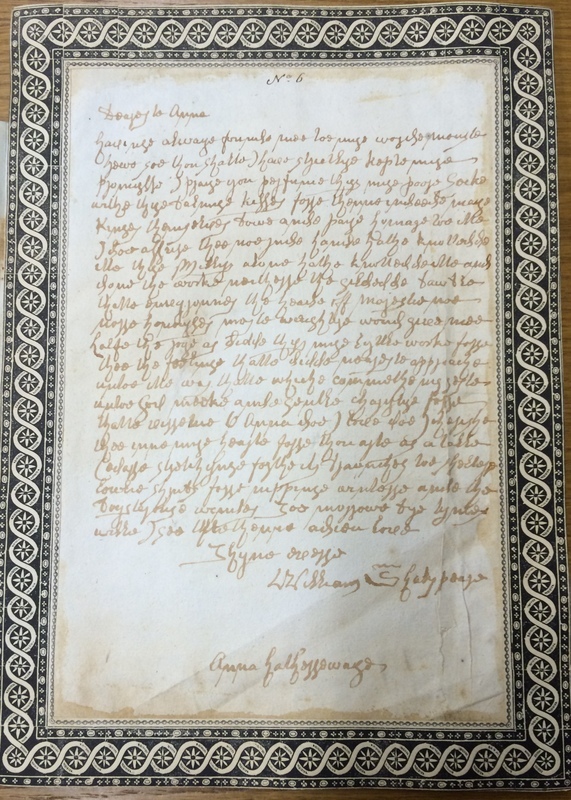 The supposed love letter is the handiwork of forger William Henry Ireland. For those of you new to him, see Arthur Freeman’s account of his identification of the original Ireland forgeries at Harvard, and the Collation post on William Henry Ireland’s forged Shakespeare library by Arnold Hunt and me. Ireland was meticulous in his impersonation of Shakespeare in this letter. 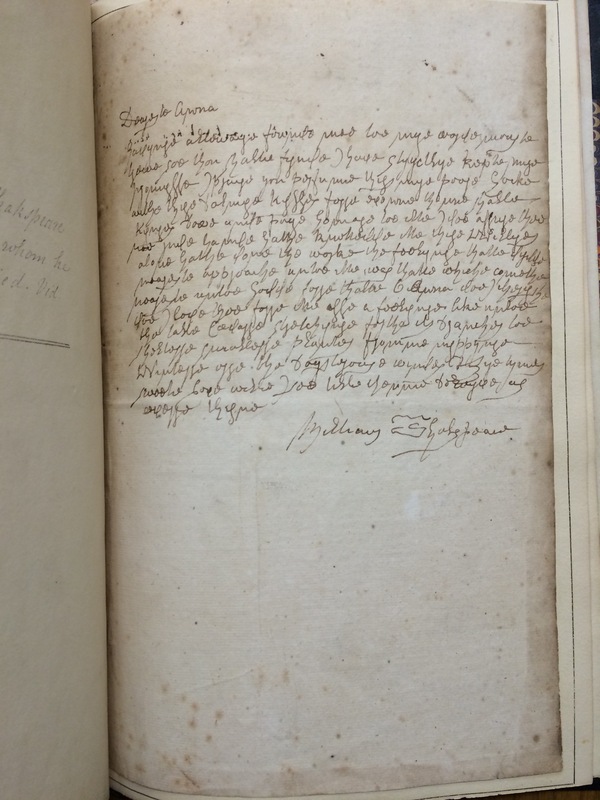 Of “his” hair, he writes, “I praye you perfume thys mye poore Locke withe thye balmye Kysses,” and assures Anne that “no rude hande hathe knottedde itte thye Willys alone hathe done the worke.” Of “his” verses, he proclaims that “Neytherre the gyldedde bawble that envyronnes the heade of Majestye noe norre honourres moste weyghtye wulde give mee halfe the joye as didde thysse mye lyttle worke forre thee.” After further protestations of love, he bids her farewell until the next day. 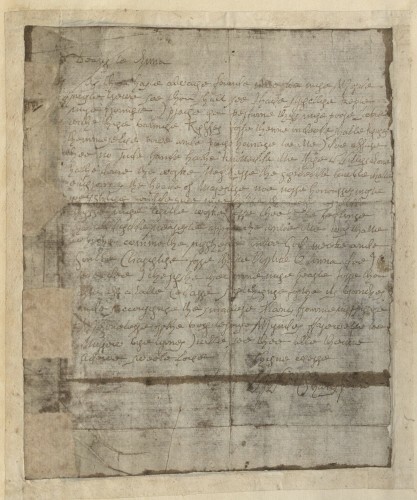 Letter from William Shakespeare to Anne Hathaway, MS Hyde 60 (5), Houghton Library, Harvard University. Photo courtesy of John Overholt. After its “discovery,” William Henry’s proud father, Samuel Ireland, reproduced it in facsimile and as a printed transcription as part of the Miscellaneous papers and legal instruments under the hand and seal of William Shakespeare (London, 1796), in both a sumptuous folio and an affordable octavo edition. Folger PR2950 A22a Copy 1 Cage. Anne Hathaway facsimile letter and transcription in the folio edition of Miscellaneous Instruments (1796). Folger PR2950 A22 Copy 3 Cage. Transcription of letter and verses in octavo edition of Miscellaneous Instruments (1796). 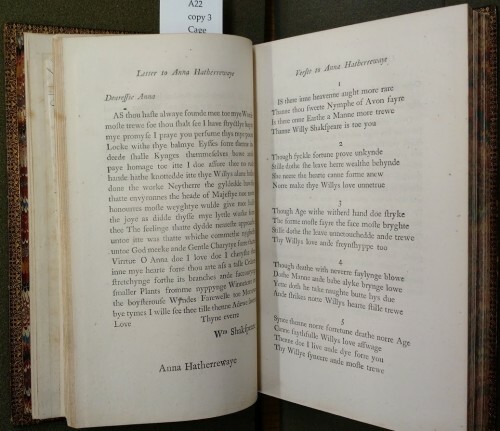 All five of the Folger copies of the love letter to Anne Hathaway were made by Ireland after Edmond Malone pronounced him a fraud in An Inquiry into the Authenticity of Certain Miscellaneous Papers and Legal Instruments (1796). Until last week, I had never actually focused on the text of the letter, or compared the various copies side by side. My assumption was that they all followed the text as it appears in Miscellaneous papers and legal instruments under the hand and seal of William Shakespeare. However, it turns out that Ireland’s copies of his forged letter from Shakespeare to Anne Hathaway have many textual variants. Folger MS S.b.119. 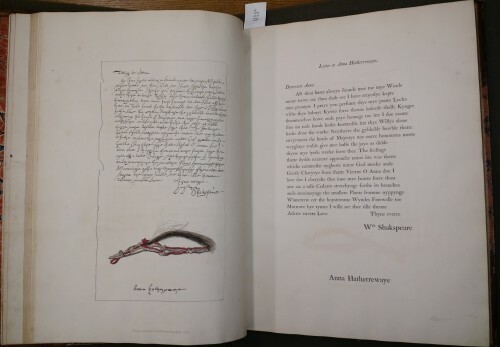 Autograph copy of Ireland’s forged letter from Shakespeare to Anne Hathaway, facing a printed transcription of it from the 1796 octavo edition of Miscellaneous Instruments. Photograph by Beth DeBold. Folger MS S.b.118. 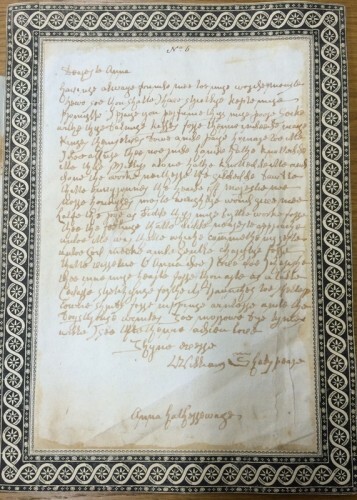 Autograph copy of Ireland’s forged letter from Shakespeare to Anne Hathaway, made by Ireland for his wife, ca. 1805. Photograph by Beth DeBold. Folger MS S.b.157. 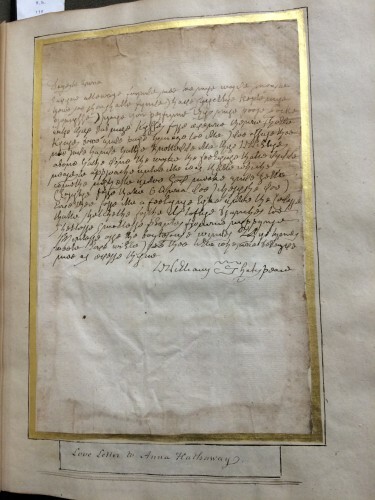 Autograph copy of Ireland’s forged letter from Shakespeare to Anne Hathaway. Photograph by Beth DeBold. Folger MS S.b.159. Autograph copy of Ireland’s forged letter from Shakespeare to Anne Hathaway. Photograph by Beth DeBold. There are many small differences in lineation, and plenty of missing words and word-substitutions. There is also at least one mistranscription, which is delightfully confusing since Ireland is transcribing a text that he himself composed. 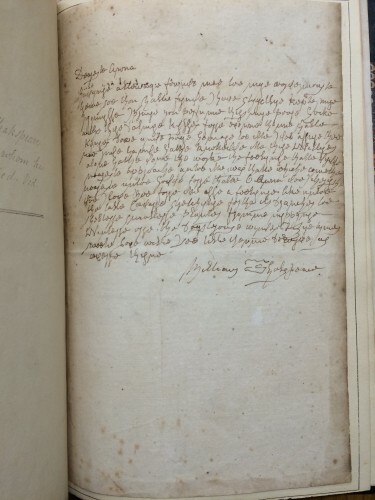 The printed transcription in the octavo edition reads “thye balmye Eysses [eyes],” while all the manuscript versions, as well as the printed transcription in the folio edition and the facsimile of the original manuscript, read “thye balmye Kysses.” Is Ireland intentionally misreading his own handwriting in the octavo to make it seem as if he is the dutiful and innocent (mis)transcriber rather than forger? 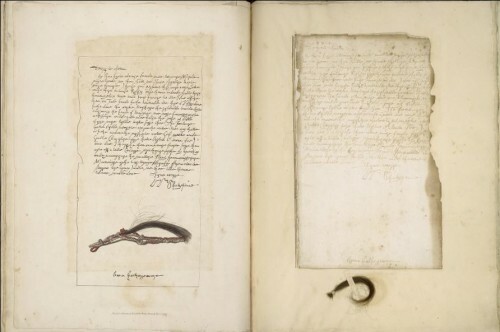 The Harvard original forgery is nearly identical, except it has the word “the” before “smaller.” The grandest of the Folger copies, and the only version that I know of with an actual lock of hair affixed beneath it, is part of Folger MS W.b.496. 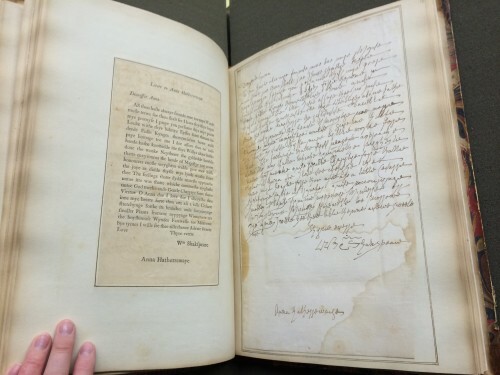 It mirrors the Harvard original almost exactly, including the word “the” before “smaller.” It faces a facsimile of the letter from the 1796 folio edition, which Ireland presumably copied directly from when he created this iteration of the letter.